These double flare teardrop plugs are handmade from dark raintree wood with abalone inlay and polished to a smooth finish by Siam Organics. Choose your size below. 1/2" to 5/8" = wearable area of 1/2"
3/4" to 1-1/4" = wearable area of 5/8"
He loved them so so much and they did fit snug, but well, just as they said they would. :) Thanks again for replying back to his answer. Was a perfect christmas gift and they look amazing! 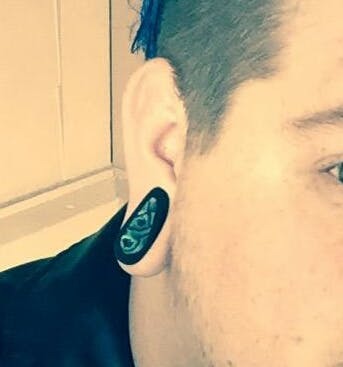 If I wear an inch normally would I still get an inch for these? If you already wear a double flared one-inch, these shouldn't be much of an adjustment. The one-inch teardrop should fit with approximately the same snugness and would be a good choice. Love love love them! First pair of teardrop plugs. Perfect shape and finish.